It’s 2017, and despite widespread perception that women’s equality is legally guaranteed, females still do not have the same rights as males under the US Constitution. 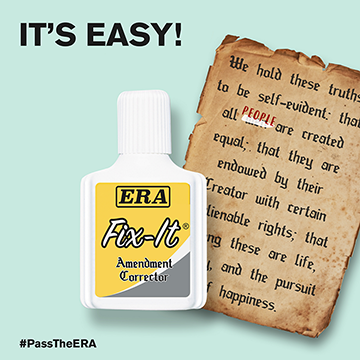 The Equal Rights Amendment (ERA), which would have made women and men equal under the law, was never ratified. So, Yulu PR’s client, LA-based creative agency enso, gathered dozens of creatives into a room for a design hackathon to produce the materials needed to speak to millennials in their language: memes. #PasstheERA was designed as a social media campaign to reach young voters with the message that until equal rights for all becomes a reality, all hands need to be on deck taking up the fight. The challenge was to reignite this conversation by getting the materials in front of as many eyes as possible. Getting a social media campaign to go viral is about timing, luck, and knowing your stakeholders. With materials ready for dissemination, Yulu waited for the right moment to pitch media and found it in the Fourth of July, a time when Americans are reflecting on history, freedom and the country’s founding principles. Political divisions and unifying the parties had been a recurring theme with media in 2017, and it just so happened Republicans and Democrats were mostly in agreement on this goal – to achieve gender equality and passing the Equal Rights Amendment. The campaign was bolstered by the support of the ERA Coalition, a nonprofit with an aligned mission and heavyweights Gloria Steinem and Jane Fonda on its board. Yulu was able to leverage these names to lend legitimacy to the campaign in its media push. Total media reach for #PassTheERA surpassed 35 million, including far-reaching coverage in Buzzfeed, Mashable, Fast Company and The Drum. Buzzfeed’s coverage of the #PassTheERA campaign reached hundreds of thousands of millennials in a matter of days. The campaign picked up steam again just ahead of Women’s Equality Day, when Fast Company ran another story reminding Americans that the ERA still has not been passed, along with several brand-new memes encouraging readers to take up the cause and share. To date, there have more than 340 social interactions with the stories generated by #PasstheERA. The total reach on Twitter alone was 19 million. This included 1,200+ social shares and 450+ social interactions (meaning likes/comments/retweets). Mashable’s article was shared 24 times and liked 51 times, Fast Company’s article was retweeted more than 130 times, and Buzzfeed’s video was viewed more than 210,000 times on YouTube. The campaign was shared on Facebook by Social Good (59K likes), Mashable Trending (614K likes), The ERA Coalition (2.8K likes) and Equal Rights Amendment (53K likes).